Paradise awaits in the Caribbean. Experience the perfect combination of relaxed days bathing in the warm sun and going on the excursions of a lifetime. The amenities and activities offered at The Residences Seven Mile Beach in Grand Cayman are here to help you make unforgettable memories. Our resort is unique in offering an unparalleled portfolio of pleasant diversions from the highbrow to the high-octane. When you stay here, you will have access to all of these activities and more. Not only do we offer these incredible amenities and activities, we created a complimentary Vacation Guide to help you plan your getaway of a lifetime. We know that planning a vacation can be challenging, so we created this carefully curated guide to make it easier for you. Many of our guests have saved hours of time researching, so get the guide today! Add another stunning golf course to your international portfolio when you play at our 9-hole course available only to guests of The Ritz-Carlton Grand Cayman, and The Residences. Designed by the legendary Great White himself, this par-36, 3,516-yard course both dazzles and delights. Its considerable challenges are boosted by the Island’s steady trade winds and a meandering natural saltwater lagoon that comes into play on 8 of the 9 holes. Tough to the end, the final par-three will test your mettle with a water-encircled island green while gorgeous views of the North Sound will reward you for a round well played. Taylor Made rental clubs are available for men, women, and children in the full-service golf shop, along with customized instruction and a caddy concierge program. Also available for golfers looking to perfect their swing is The Bunker indoor golf center, which features the island’s first track-man golf simulator. Use the same technology as the pros to practice your game and get real-time stats and feedback on how to improve. Check out our blog on everything you need to know about playing golf in Grand Cayman. 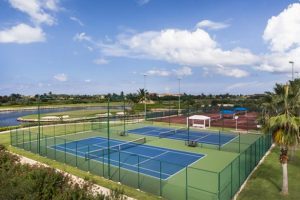 Take advantage of the three clay courts and two hard courts the resort offers. With the island’s only tennis apparel and equipment shop available at your fingertips, you’ll love coming out to play a few rounds. Practice against the backboard or use the Center’s many services. From game matching to instruction by Bollettieri-trained pros, you’ll have everything you need to get out on the court. There are also tennis camps for kids and unique Cardio Tennis fitness classes for adults. Vacation is all about relaxation, especially when your getaway is in paradise. Between sipping tropical cocktails on the beach, come relax, revive, and rejuvenate with a restorative experience at la prairie spa. With its shimmering walls of water and cool silver palate, this refreshing oasis offers a tranquil respite from the Caribbean sun. Step over the dramatic up-lit stone bridge into a world of pure indulgence. 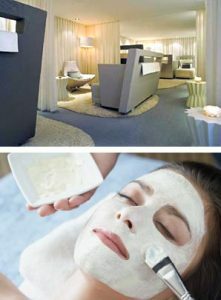 Here, you will be treated to therapies based on the pioneering research of the Swiss-based Laboratories la prairie, a world leader in skin care. Many feature la prairie’s exclusive Cellular Complex which activates the skin’s metabolism and prevents the signs of aging. Combined with tropical extracts and essences indigenous to the Caribbean, hydrotherapies at this spa turn back the hands of time like nothing you have ever experienced before. From stress-melting massages to signature full-body treatments like Diamond Perfection, a visit to the 20,000-square foot la prairie spa is the ultimate escape and a perfect complement to your vacation. 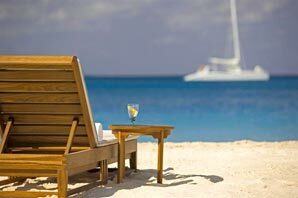 The Resort is located directly on the majestic white sands of Grand Cayman’s fabled Seven Mile Beach. Stake your claim on a comfy oceanfront beach chair or opt for a luxurious private cabana. Bask in the beauty and serenity of the breathtaking beachfront setting while you indulge in the Resort’s unparalleled personal service. If you would rather sunbathe by the pool, you have the choice of two. The signature oceanfront pool overlooks Seven Mile Beach while the North Sound pool offers a refreshing oasis for sunning and swimming. 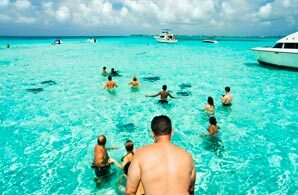 Grand Cayman has long been considered one of the top snorkeling and sailing destinations in the Caribbean, and the Resort offers a comprehensive array of water sports adventures on site and nearby. Snorkeling lessons are available to acquaint “newbies” with the basics of this safe and exciting way to explore the undersea world. Kayaks are also available, along with water trikes and rafts and water hammocks. Or try your hand at sailing a 13′ Hobie Wave right off the beach. And, of course, sailing and fishing charters can always be arranged. Sapphire Watersports offers its guests every opportunity to enjoy the Caribbean Sea. 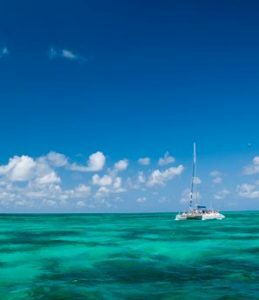 Charter a sleek 27 foot Boston Whaler or watch the sun slip below the horizon from the deck of a majestic power catamaran. Sit back, relax, and enjoy your exploration of the waters off North Sound. Budding naturalists and their families will never forget all that they see, do, and learn in the Resort’s amazing Ambassadors of the Environment program. Created by Jean-Michel Cousteau, life-long eco-warrior and founder of the Ocean Futures Society, you will learn while being entertained on these incredible excursions. Based in the Heritage House, a sustainable Caymanian-style cottage built with recycled materials, run by solar power, and surrounded by teaching gardens, Jean-Michel’s Ambassadors of the Environment introduces guests to the natural wonders and cultural traditions of the Cayman Islands. Offerings are divided by age groups and run the gamut from gentle fun for children aged 4 to 7 to more exciting experiences for kids 8 to 18. There are even some adult adventures on the roster. No matter your age, everyone will find a program that suits them. Counselors have college degrees in ecology, marine sciences, or related fields. Programs range from creating solar prints and baking cookies in a solar oven to kayak adventures amidst mangrove-lined waterways. 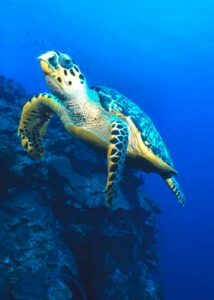 And, of course, there are plenty of opportunities to get up close and personal with the Island’s fabled sea turtles, blue iguanas, and stingrays. 25 exciting three-hour programs are offered each week. Blue by Eric Ripert has managed to transfer the best of Manhattan’s world-famous restaurant scene to the beautiful Cayman Islands. Seasoned with a dash of Caribbean flavor and styled with Island flair, this award-winning restaurant is almost as much a feast for the eyes as it is for the palate. With a menu that revolves around the fresh-caught bounty of the Caribbean sea, Blue takes gastronomy to ethereal new levels with almost impossibly creative riffs on fresh fish and seafood cookery. 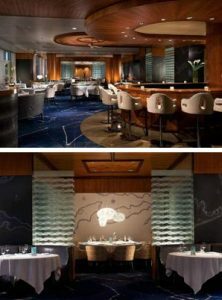 Enjoy a carefully orchestrated symphony of flavors and a rave-worthy dining experience when you opt for one of five tasting menus, including the signature Blue by Eric Ripert menu or the Eric Ripert Classics menu featuring the fabled tuna foie gras. A wine cellar with more than 800 selections, one of the best in the Caribbean, rounds out the restaurant’s opulent offerings. The soft sands and sparkling waters of the Cayman Islands are calling you. 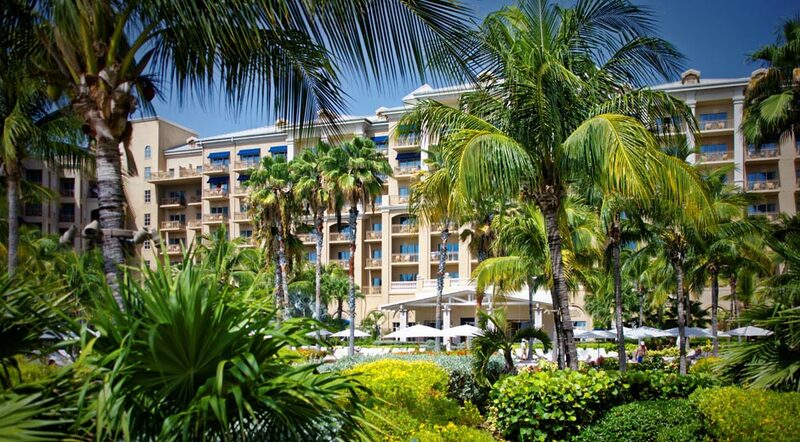 It’s time to start planning your stay at The Residences Seven Mile Beach in Grand Cayman. With so many incredible amenities and activities, you’ll have everything you need for the perfect getaway. Browse our luxurious properties to start planning your stay today!